In recent years Lloyd Dugger, U-32’s current band teacher, started dropping in to play drums for them. After months of recording their musical improvisations, they discovered that what had started out as simply a fun way to relax and mess around with music actually turned into an album making process. 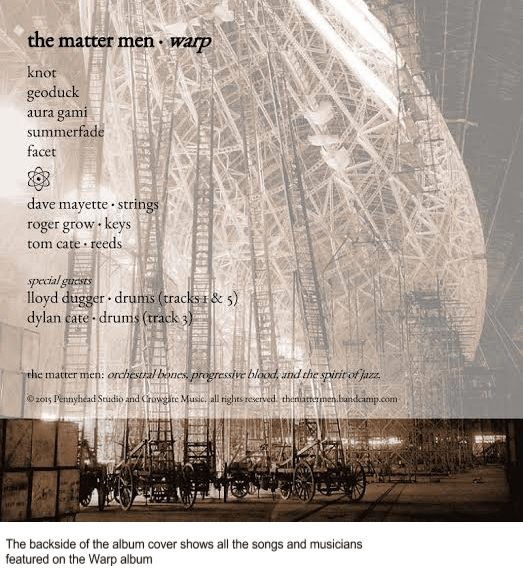 “Some people jog,” Roger explains, “and other people paint, but for me, playing music is the way I choose to relax and express myself.” Coming into the month of September, The Matter Men are now putting the finishing touches on what is soon to be their first published album, Warp. Amazingly, all the songs on their new album were made up on the spot; no planning or coordination involved.“When we’re improvising, we don’t start with really any preconceived notions at all. We just sit down and start playing. Somebody just starts something and we all just respond back and forth, and lots of times what we come up with isn’t really very good,” Roger says. However, after months of accumulating music, they began finding things here and there which they found to be usable. “We kind of treat it like we are mining, or like we’re going into the mountains. Then we end up finding things through mountains and mountains of material that we can go back through and decide on whether it works,” Roger explains. Eventually they started realizing that some of their pieces were even similar enough in style that they could be considered for putting into a formal album. Whatever the success of the album will be, The Matter Men still plan on creating more music in the future. Music is their passion. “In every job I’ve had,” Roger says, “I’ve always said that I’m a musician first, and a teacher second.” Ready to hear whatever the public has to say, The Matter Men look forward to getting their album out by the end of September. This certainly won’t be their only album; in fact, they already have two more in the works. Warp doesn’t officially come out until the end of the month, but you can click on this link to hear a hint of what kind of music is going to be on the album.